Google Maps product manager Evan Rapoport revealed another Android 4.3 change on Google+ this morning - better photo spheres. Photo spheres were introduced in Android 4.2, and I truly believe they're one of the biggest things to happen to personal photography in years. They're limited to Nexus devices for the time being - and viewing outside of Maps / Google+ is still hard - but it's encouraging to see that Google is still going strong developing the feature. 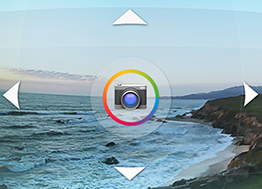 There are two changes to photo spheres in Android 4.3, but they're big ones. First, alignment and stitching are "much better" - arguably two of the biggest problems with photo spheres. Second, exposure compensation across individual frames is now better, meaning your photos won't look weirdly washed out or dark in certain regions as you pan around. Tl;dr - your photo spheres are going to look prettier. And based on the sphere Evan uploaded to showcase the changes, I believe it - there is still some visible stitching and a couple of alignment anomalies, but the exposure is remarkably consistent compared to a lot of the older spheres I've seen, as is the overall composition. Just one more thing to look forward to (for Nexus users, at least) in the latest version of Android.